Slice of Pi Quilts: Chuggin' Along! This year, Joan, the owner of the shop, designed the Row using the Accuquilt GO! dies for the train and zoo animals. I wrote the pattern for the Row - available only in-person at The Stitchin' Post starting June 21st! I'm going to tell you a little secret. I had my mom make the Row sample. (Say what?!?) 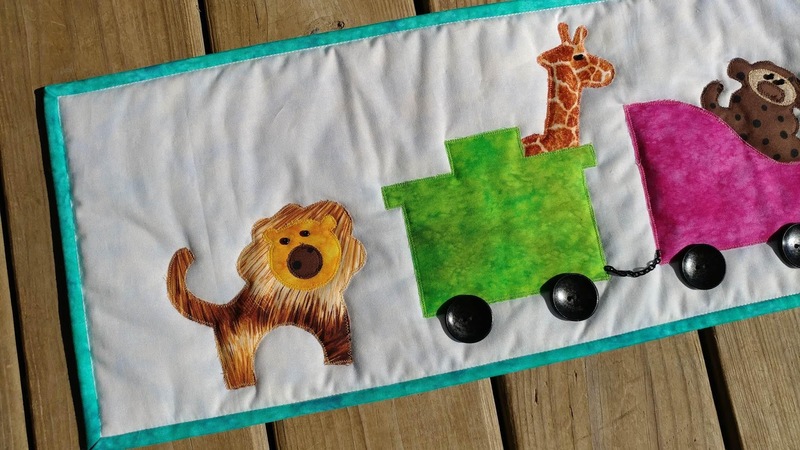 I'm just really not into applique, and she volunteered, so I jumped at the offer! She did an AMAZING job! Joan will be selling kits for the pattern in her shop. 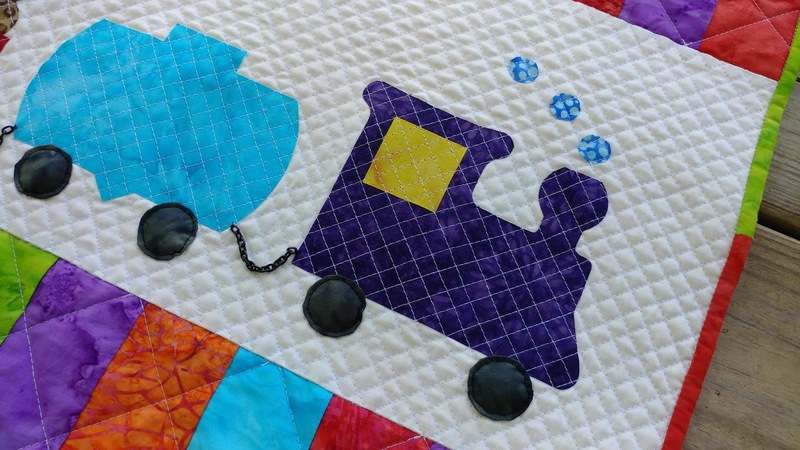 The kits have black buttons for the train wheels, gray buttons for the steam, black beads for the animal eyes, and black chain to connect the train cars. The embellishments really make the Row unique! I wanted to make a second version to show the Row used in a different way. 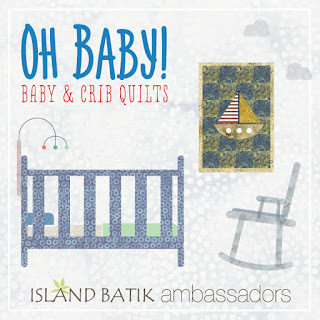 As an Island Batik Ambassador, I have different quilt challenges each month. I decided to look ahead a couple months to see if the Row might work for one of the challenges. Alas! The July challenge is to make a baby quilt - and the animal train Row would make a great baby quilt! I chose some bright fabrics from the Island Batik basics and blenders (the same ones that I used for my modern mini quilt in May). The background for the Row is Moda Bella white. 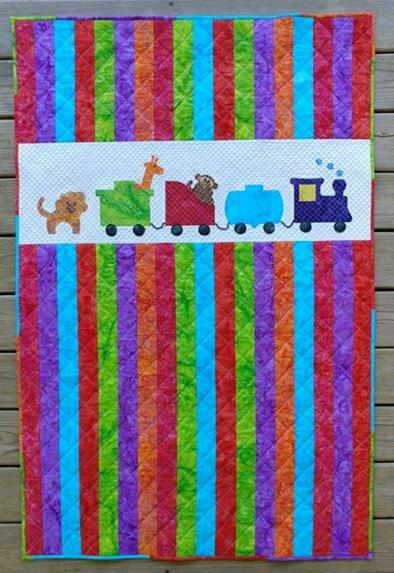 I used some Island Batik scraps to make the train and animals. 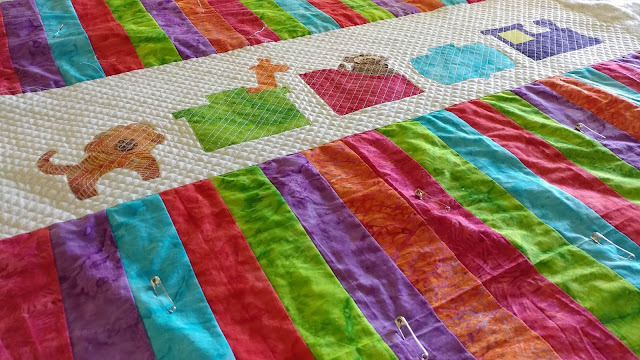 I sewed 2 1/2" x WOF (width of fabric) strips together to create the rest of the quilt top. 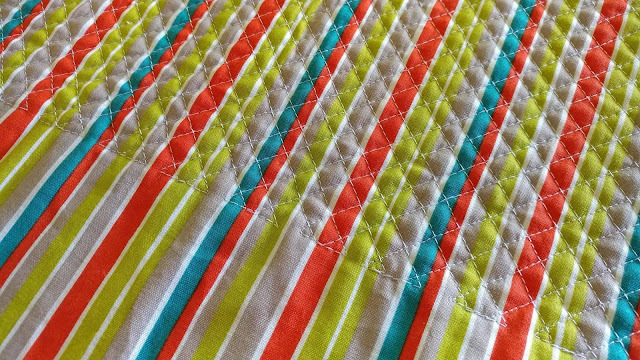 Once sewn, I cut the strips about 1/3 of the way down from the top and inserted the Row. I really didn't want to applique each individual shape (just the thought is time consuming! 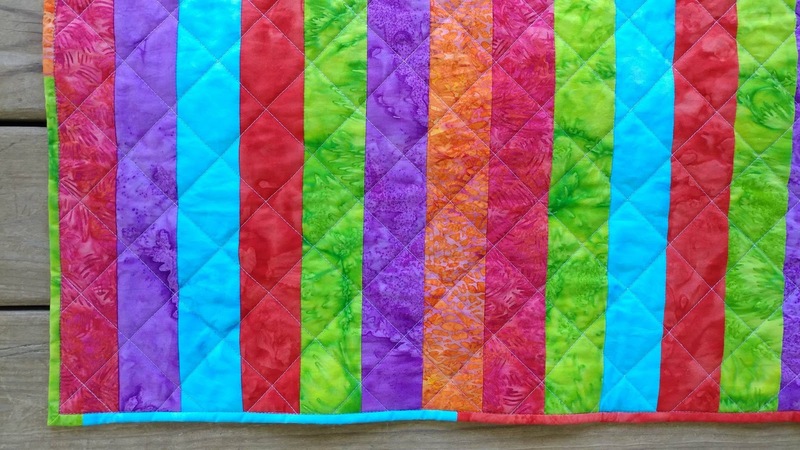 ), and I really wanted to use the same technique that I used on the License to Shop mini quilt. 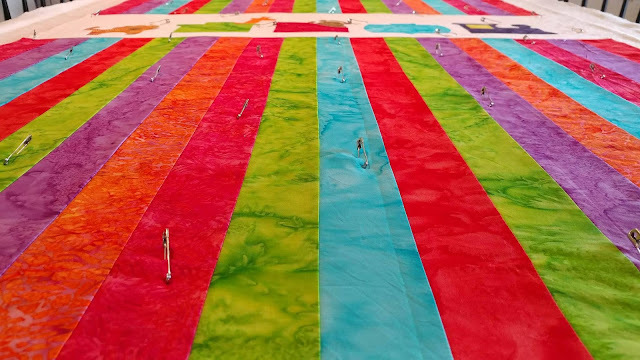 However, some of the pieces are quite small, so I would need to quilt the lines very close together. 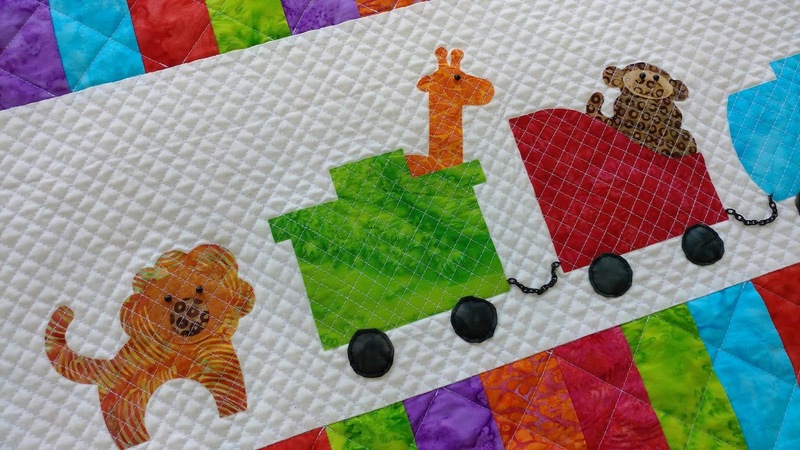 I quilted diagonal lines in both directions to create a grid over the train and zoo animals. Then I used the same diagonal grid to quilt the striped section, but increased the distance between the lines to 2" apart. 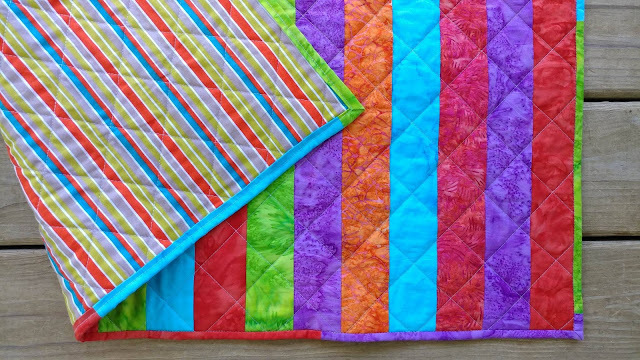 I definitely under-estimated the amount of time the quilting would take! It was much more time consuming than I anticipated due to having to turn the quilt at the end of every line. Once quilted, I used the fabric scraps I had left over to make a scrappy binding. I decided to make yo-yos for the train wheels instead of using the buttons that come with the kit at the shop. 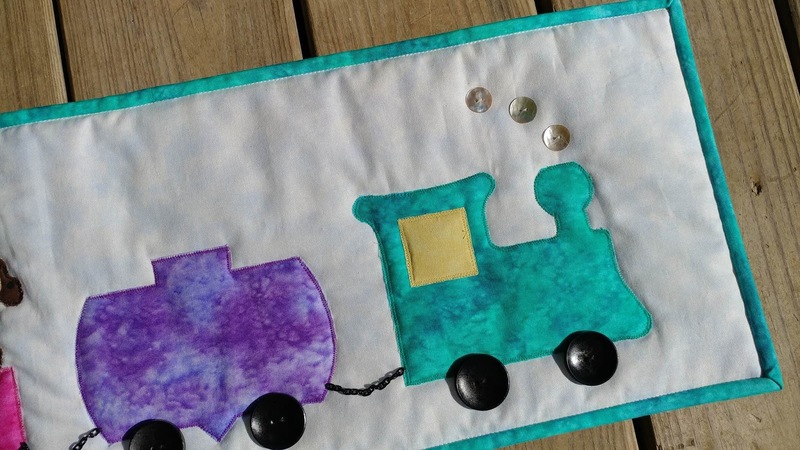 But I did use beads for the animal eyes and the black chain between the train cars. 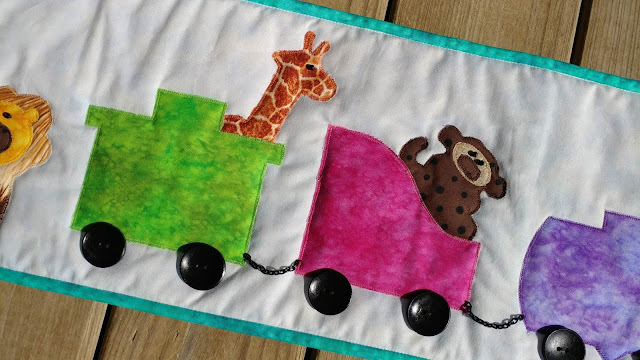 I don't think the beads for eyes or chain are really baby friendly, but I decided to keep them the same as what is in the kit at the quilt shop. 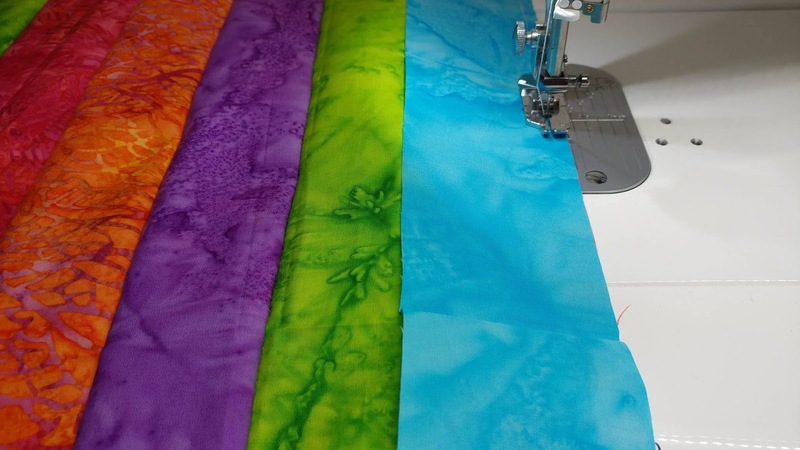 I think using a decorative stitch on your sewing machine would be a great alternative to the chain. 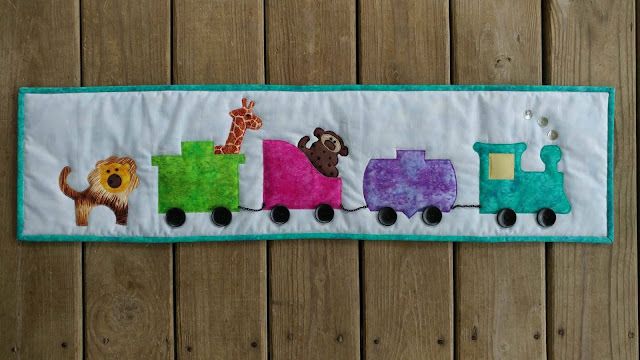 And a French knot would be a more baby-friendly eye than a bead. 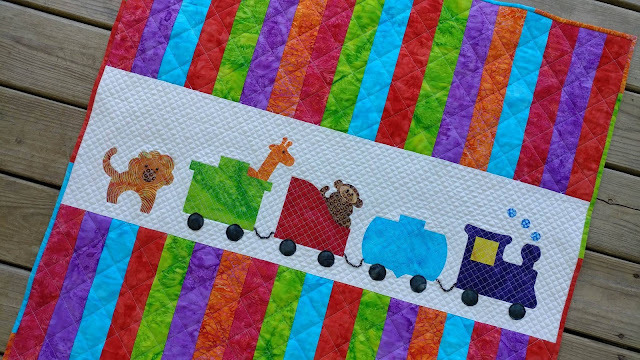 I added all the extras after quilting. 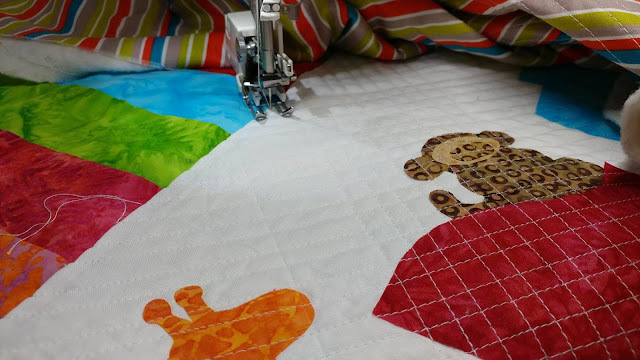 I'm not used to adding embellishments to my quilts! This process took longer than expected too! Now that it's finished, I think I need to add a label to the back that says "This took forever!" 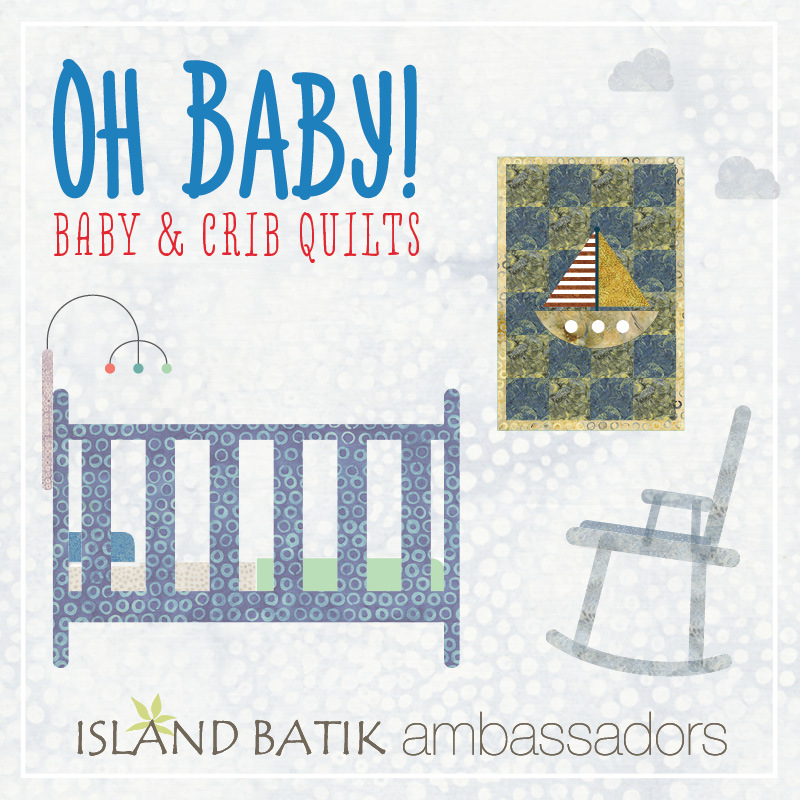 The finished quilt is about 36" x 50" - a great crib size! 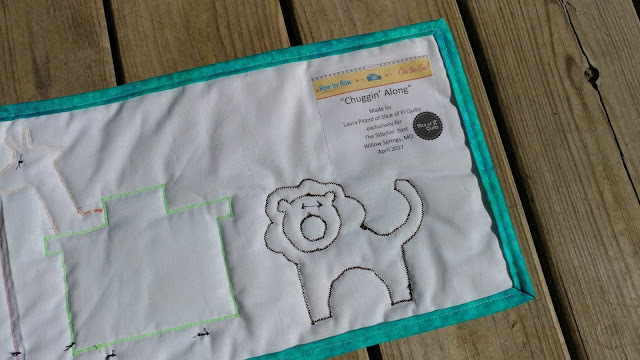 If you're anywhere near Willow Springs, Missouri this summer, be sure to stop into The Stitchin' Post and pick up a pattern for Chuggin' Along! Love the crosshatching you did on the row for the baby quilt! 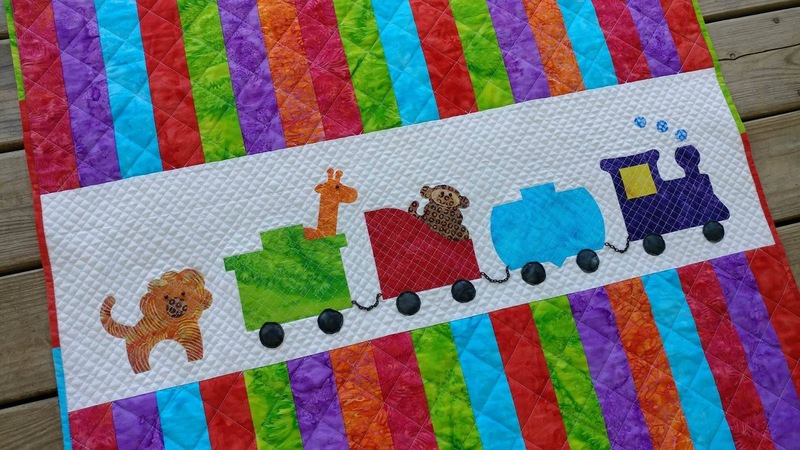 This is just adorable--design, colors, quilting! This is my new favorite baby quilt--but, oh, the time :( BRAVO!! 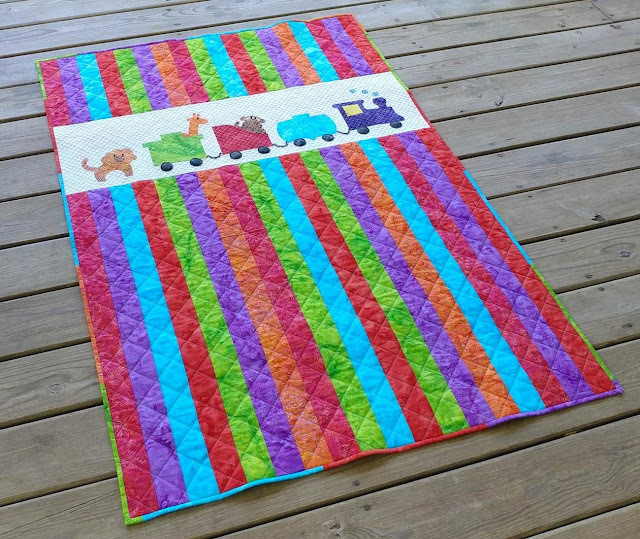 Darling quilt. If I was anywhere near Missouri (I'm in Nevada), I'd be sure to get the pattern. 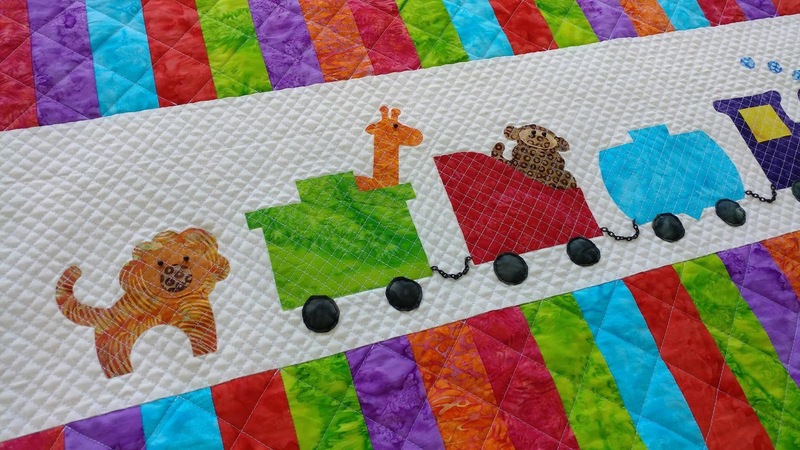 This goes to show that quilts don't have to be filled up with lots of intricate applique to be cute for a baby. Such great versions! How lovely to have your mother's help. 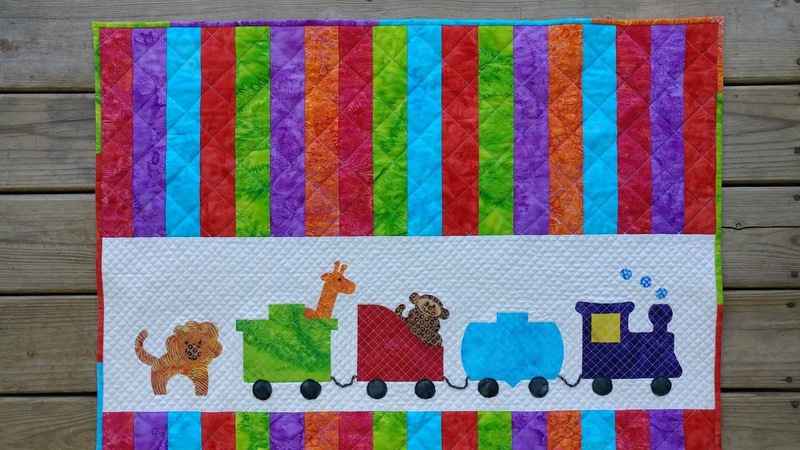 Also, I love seeing the row in a baby quilt! 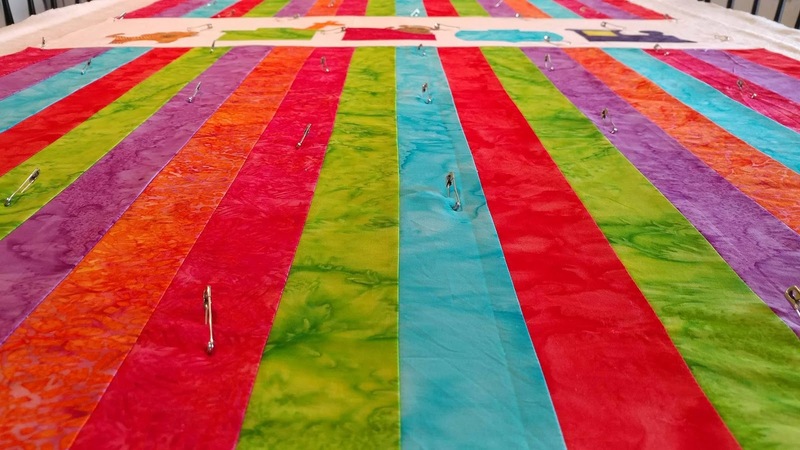 I did a lot of rows a few years ago, and less the past two years, but I do have one or two to do, so this gives me an idea besides the table runners I have made with a few!